ErinChris Photo Blog: Erin Chris Photography got a facelift! Erin Chris Photography got a facelift! 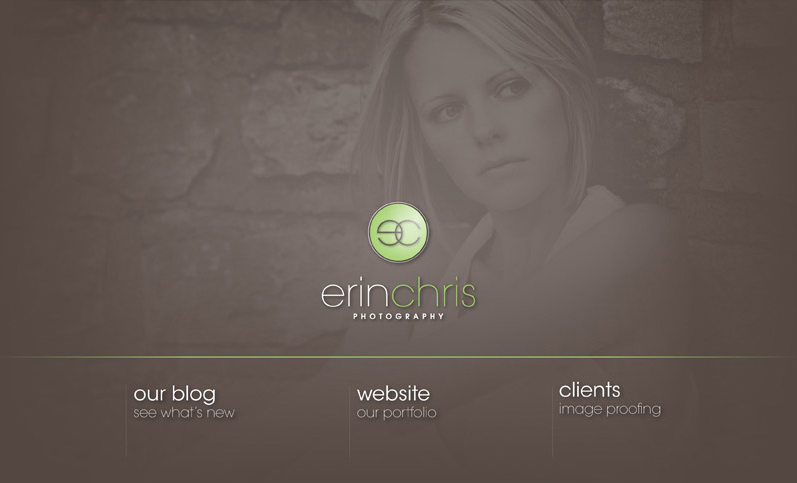 As you guys might have noticed there's a new look here at Erin Chris Photography. While we did love our old colors and branding, we decided that as we've grown we wanted to update our look to better match our style and brand. The new look is modern, clean, sophisticated, and with a touch of bold color, just like we strive for with our images. =) We want to say thanks to Eric, our good friend and graphic designer extraordinaire, for helping design the new splash page, business cards, and pricing sheets. We hope you guys like it, and there will be a few more tweaks here and there along the way. Leave us a comment and let us know what ya think! I like it! I like it a lot!!!! Love it guys!!! :-) Great job! Congrats on the new look! How exciting! AMAZING!!! =) I love the new design. Armin: Haha. Yeah. Thanks for helping us get it all locked in! We are definitely happy with it. Oh, my - it's been way too long since I've visited ya'll! I LOVE your new look. It fits you perfectly. Clean, modern, a fun. Great job! It looks great! I need to update my page too, I'll get around to it......someday.